We offer Giraffe Long Span Shelving which is a modular frame and beam shelving system that caters easily for large bulk items. Giraffe Long Span Shelving is constructively similar to light pallet racking but designed to store non-palletized goods. This is an intermediate application between light and heavy-duty applications. 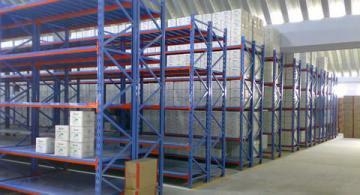 Long span shelving is designed for loading/unloading goods manually without mechanical equipment. Stored goods can be from smallest components to large and awkwardly shaped items. Durable and precision engineered, our range is both durable and safe to use. It can be customized as per the specific requirements of our clients.